Temperatures are soaring here in Minnesota. Some summers are so cool I barely wear shorts, but today I actually had to put on the air – and when that happens, you better believe, you betcha, that I’m looking for cool things to eat and ways to keep the oven off! This is one of the strangest recipes but really “works” and it is amazingly good. Think of a super creamy creamsicle with a little tang and a lemon flavor instead of orange. I first found this back in ’02 in Bon Appetit. I never told my kids what was in it and they’ve “lapped” it up every summer, for the past ten years. These are super easy: three ingredients: Buttermilk, Lemon and Sugar plus the optional Thyme. 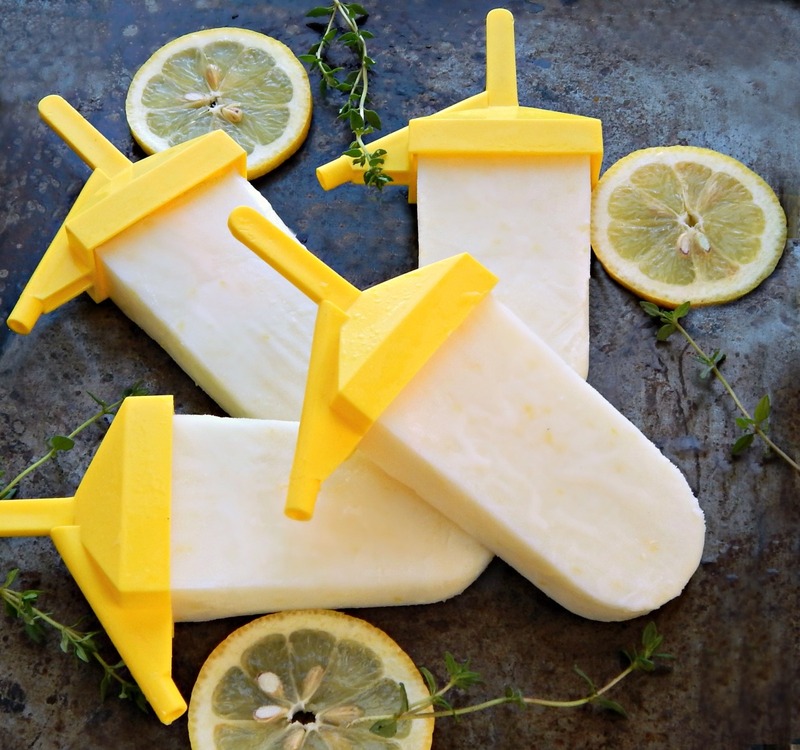 I did adapt the recipe just a bit – I cut back on the sugar and changed the size to fit my popsicle mold, and rather than trying to juice and measure, I just use two lemons. Seriously, who wants to waste lemon? I microplane the lemon zest and you can just barely detect it in the pops, which I don’t mind at all. If a very slight texture bothers you, maybe leave it out (which would be a bit of a shame with their bright flavor) or maybe give it a whirl in the food processor or blender. In my Progressive molds, this makes about 10 popsicles, but molds vary. If you’re uncertain how much your molds hold, fill with water and then measure that water. Zest lemons and squeeze into a container with a spout. Add zest and sugar and whisk, add part of the buttermilk and mix until sugar is dissolved. Add the rest of the buttermilk and stir. Pour into the molds and freeze for about four hours and up to five days. There are two tricks that help keep the popsicle sticks in the right place in the popsicle if using wooden sticks: Either presoak the sticks for about an hour or wait until your mixture has started to set up and add in the sticks..
One thing to make life easier: When you unmold popsicles, generally you dip the molds in warm water which can create a damp surface on the outside of the pop. No problem if you’re eating them a.s.a.p., but if you want to store them, line a flat pan with wax or parchment and freeze until the popsicles have rehardened, then wrap. Here are the values for a Lemon Buttermilk Popsicle, based on 10 popsicles: Cal 103; cal from fat: 4.45 (4%); tot fat: .55g; chol: 2.21mg; sod 58.73; tot carb: 24.95; fib 1.02g; sug 22.6g; prot 2.08g. I kept coming up with recipes in my search that only used 1/2 cup of sugar, but as I examined them, they were only using about 1 1/2 cups of liquid. Most of them claimed to be “healthy” but what I’ve found is that most popsicle recipes follow a fairly standardized ratio of sugar to liquid so they’ll set up properly. Buttermilk: I’ve never seen buttermilk on sale, but if it goes on sale in your area, grab it. It keeps forever in the fridge, but you’ll need to shake it. Try pouring it into a clean jar for storage. I do try to have in mind other recipes to use up the rest when I buy it. Lemons: Do go on sale, pick the heaviest, not the prettiest ones. (Oh, if only real life were like that!) They do last for a good amount of time in the fridge, loosely bagged in plastic. Don’t let them get wet with condensation or they’ll rot away. Sugar: You can almost always get sugar on sale, especially during any holiday week. Thanksgiving through New Years usually has great sales with coupons, so stock up. Just a touch of thyme makes these really interesting, but it only really takes a few small leaves to flavor the whole batch. Be careful – the flavor comes through strongly! Maybe try a few leaves in one or two to see if you like it. I haven’t tried these with orange (the lemon is just that good) but I can’t imagine you could go wrong with it! This entry was posted in Click here for Fabulous Food Posts and tagged Buttermilk, Desserts, frozen desserts, Frugal Hausfrau, Fruit, Lemon, lemon buttermilk popsicles, Popsicle. Bookmark the permalink. I love mine, too! And stalk all you want – I love it! And I promise to stalk you, too! When I first saw microplanes on food network, there weren’t any places to buy them, and amazon wasn’t what it is today, or even the internet. I decided that a little tool I saw at the hardware store would work, and it did, but it rusted almost right away. I was bummed, but now have one and love it!